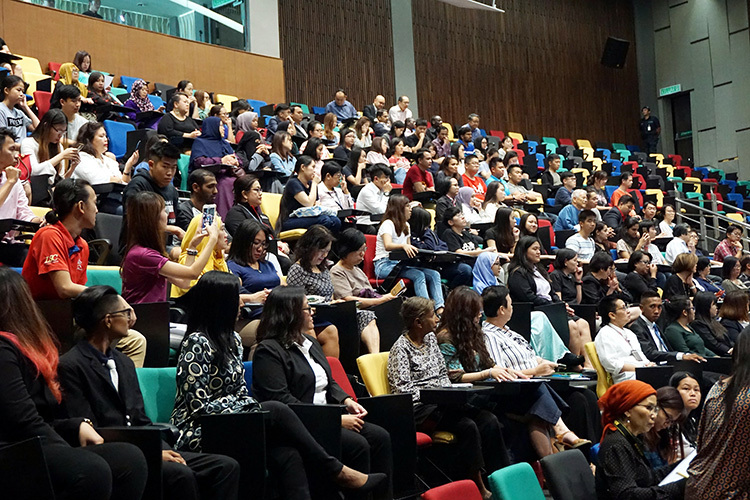 Miri – 17 September 2018 – Over 200 staff and students of Curtin University Malaysia (Curtin Malaysia), invited guests and members of the public witnessed the official launching of the Institute of Marketing Malaysia Student Chapter (IMMSC) of Curtin Malaysia at the university’s campus here recently. 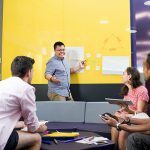 The IMMSC of Curtin Malaysia, established in January 2018, is the nation’s first Institute of Marketing Management (IMM) student chapter dedicated to providing students of all disciplines a platform to enhance their marketing knowledge and skills through a wide range of marketing-related activities. 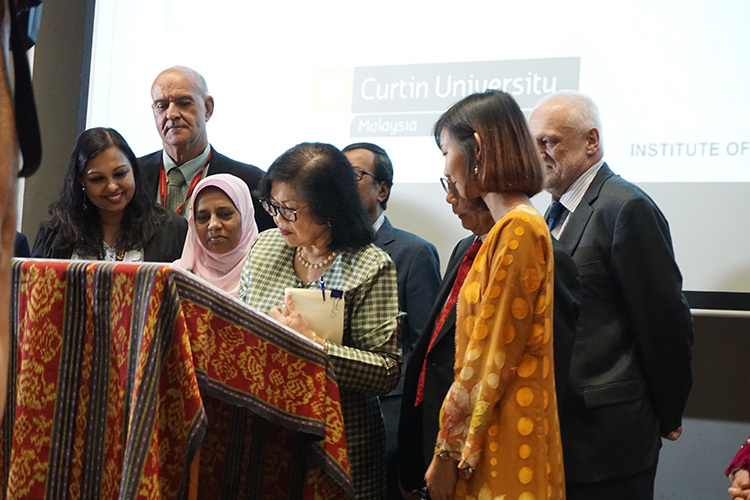 The launching was officiated by former Minister of International Trade and Industry and former patron of the IMM, Tan Sri Rafidah Aziz. It included a presentation of certificates to the founding IMMSC committee members led by former president and marketing and management graduate Annithaa Pandiapp, who is now a business development executive with IMM and IMM advisor to the IMMSC. Witnessing the launching were IMM President Dato’ Sharifah Mohd. Ismail, former Sarawak deputy chief minister and Curtin Malaysia Pro-Chancellor Datuk Patinggi Tan Sri Dr George Chan, Curtin Malaysia Council member Datu Dr Hatta Solhi, and Curtin Malaysia Pro Vice-Chancellor, President and Chief Executive Professor Jim Mienczakowski and his deputy, Professor Beena Giridharan. 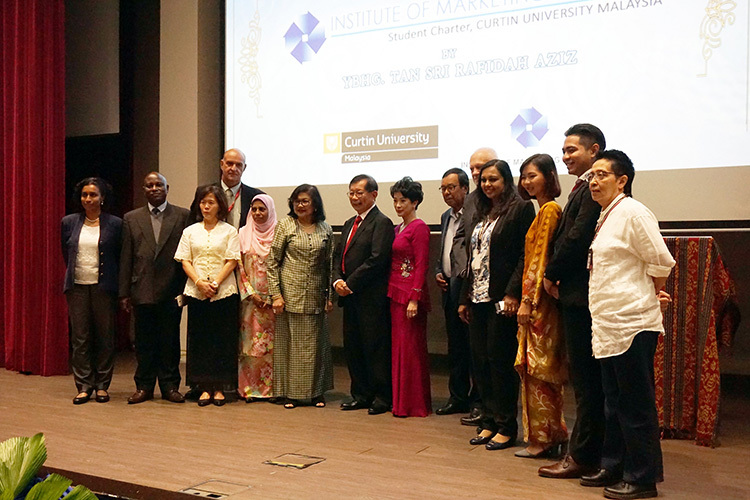 Also present were staff of Curtin Malaysia’s Faculty of Business headed by Acting Dean Associate Professor Pauline Ho and Acting Deputy Dean Dr Shamsul Kamariah Abdullah, who is faculty advisor to the IMMSC of Curtin Malaysia, as well as current IMMSC of Curtin Malaysia president Yin Shu Wen. Following the launching, Tan Sri Rafidah gave a talk on the Internet of Things (IoT) and Industry 4.0 in which she stressed the importance of being technology and Internet savvy and having product integrity in the marketplace today. She urged marketeers to prioritise what she termed the 3Ps of marketing today – profit, people and the planet – to remain relevant. Elaborating on the 3Ps, Tan Sri Rafidah said above profit, companies must prioritise the welfare of their staff and customers while their products and services must be produced using environmentally-friendly technology that ensure a sustainable planet. Among factors that make good marketeers are innovation, ability to pre-empt what is going to happen, including changes in the industry, particularly Industry 4.0 as current technological innovations have the potential to strengthen and improve not only the economy, but also the world as a whole. 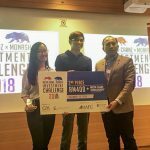 On the IMMSC of Curtin Malaysia, she commended Curtin Malaysia for pioneering the chapter and hoped it would inspire more universities to set up their own student chapters. 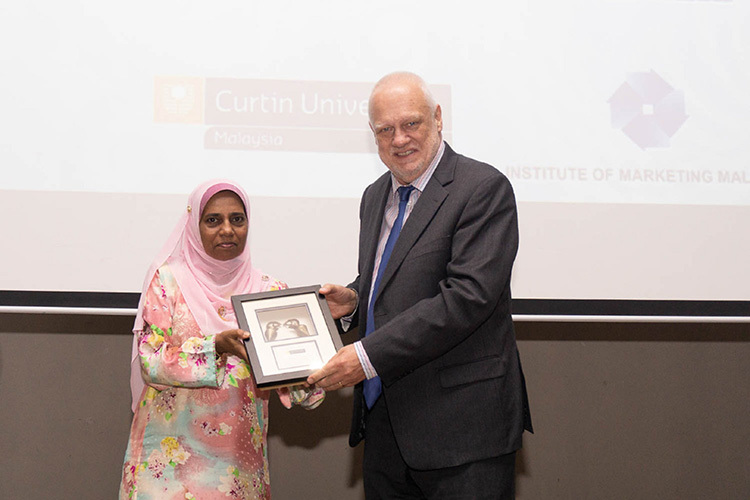 The IMMSC of Curtin Malaysia was initiated by a group of students of the Department of Marketing at Curtin Malaysia’s Faculty of Business with the support of Head of Department Dr Samuel Folorunso and Dr Shamsul Kamariah. The IMMSC serves as a platform for members to apply marketing concepts they learn in the classroom to different real-world situations, as well as attend workshops, seminars, talks and other marketing related activities to enhance their understanding of marketing. The chapter also works towards building lasting and meaningful relationships with professional bodies and industry, including organising industry visits to give members insights into the marketing profession and career opportunities available. In his speech, Datuk Patinggi Dr Chan said Curtin Malaysia was proud to have the first IMMSC in Malaysia. He lauded IMM for opening it to students of different disciplines so that all will have the opportunity to enjoy its membership benefits and activities. 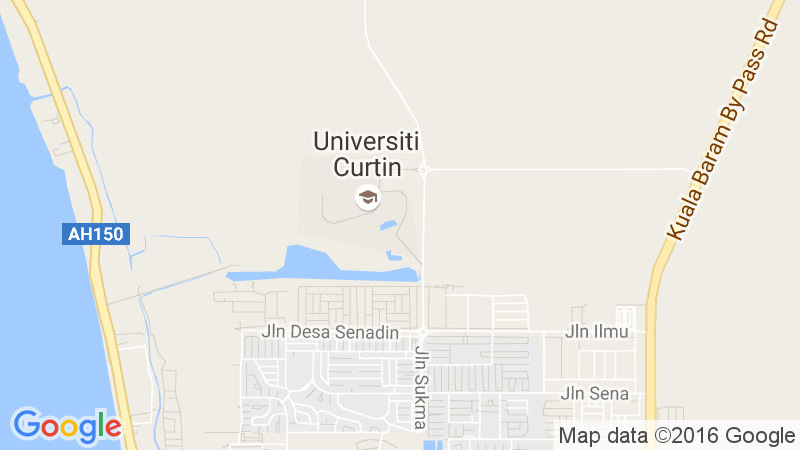 He said that as Curtin’s largest international campus and global hub in Asia, as well as a world-ranked Australian university in Malaysia, Curtin Malaysia’s challenge and opportunity is to not only to help create a well-educated and well-trained workforce that can rise to competition from around the world, but also ensure that young people can flourish, and have the opportunity to unleash their potential. 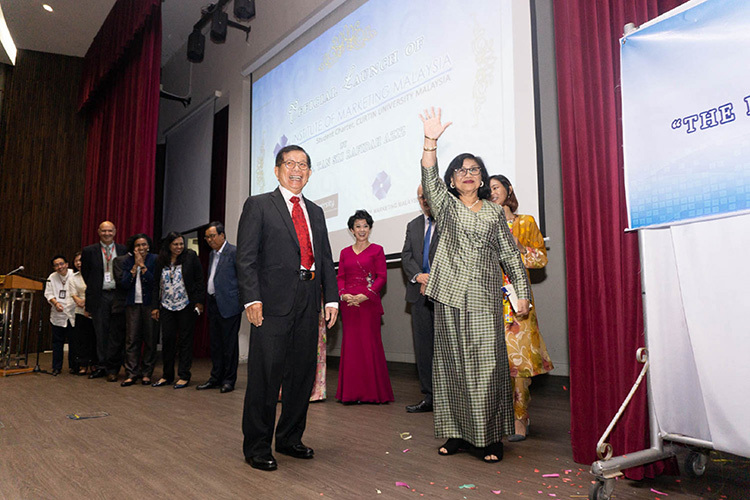 This was echoed by Professor Mienczakowski, who cited IMMSC founding president Annithaa as a shining example of the quality graduates Curtin Malaysia produces – graduates who are job-ready, capable of working effectively across different cultures and disciplines, and making significant contributions to industry. Meanwhile, Dato Sharifah said the IMMSC was planned as early as 2014 with the signing of a memorandum of understanding for collaboration with Curtin Malaysia. 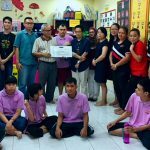 Besides the establishment of the IMMSC, it set the framework for ongoing collaboration for the benefit of both organisations as well as the students and the community at large. 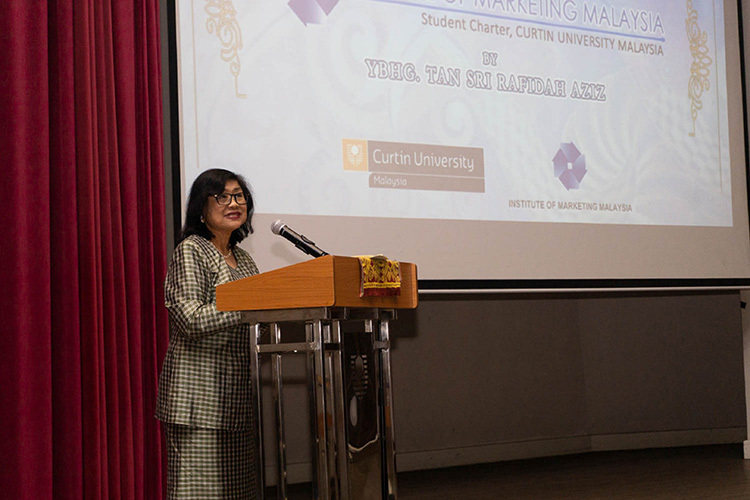 She added that the launch of the IMMSC at Curtin Malaysia marked another milestone and achievement for IMM in expanding its role in reaching out to students and helping them in expanding their marketing knowledge and skills and ultimately prepare them for the working world. The IMM is the only registered Institute in the country serving the marketing fraternity in Malaysia. It was founded in 1977 by Tengku Razaleigh Hamzah who also became its first patron. Formed under the Societies Act 1979, the Institute assists, trains and brings together marketeers from various businesses and industries with the goal of improving the marketing skills of its members. Members of IMM are affiliated to the Asia Pacific Marketing Federation (APMF) as well as the World Marketing Association (WMA). The gathering of students, staff and members of the public witnessing the launching of the IMMSC. 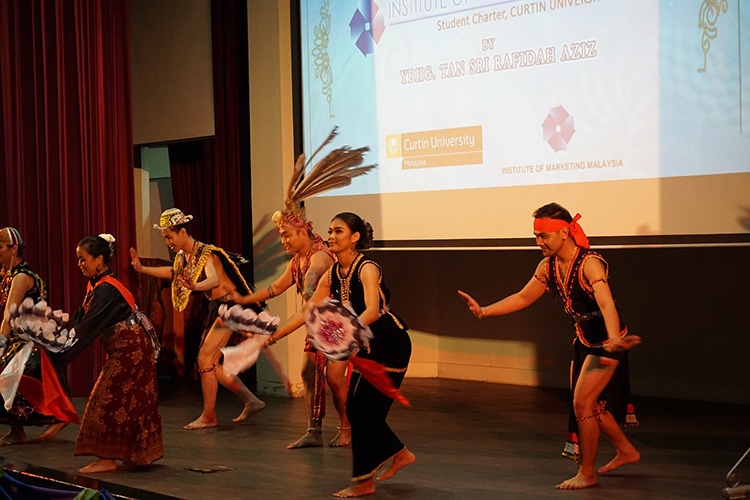 Colourful cultural dance performance by staff of Curtin Malaysia. Tan Sri Rafidah waving to the crowd as Datuk Patinggi Dr Chan (left) and others look on. Tan Sri Rafidah signing plaque to launch the IMMSC as Dato Sharifah (3rd left) and others look on. (L-R) IMM Council member Kamala Vainy Pillai, Dr Samuel Folorunso, Assoc Prof Pauline Ho, Chief Operating Officer Pieter Pottas, Dato Sharifah Mohd. Ismail, Tan Sri Rafidah Aziz, Datuk Patinggi Dr George Chan and wife Datin Patinggi Puan Sri Wira Lorna Enan Mulloon, Datu Dr Hatta Solhi, Prof Jim Mienczakowski, Prof Beena Giridharan, Yin Shu Wen, organising chairperson Muhammad Falah Effendi Yunus, Dr Shamsul Kamariah Abdullah. 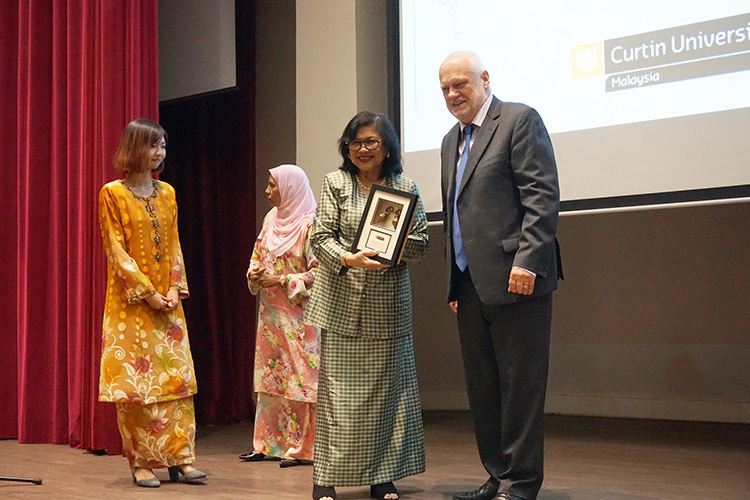 Professor Mienczakowski presenting souvenir to Tan Sri Rafidah. Professor Mienczakowski presenting souvenir to Dato Sharifah. Tan Sri Rafidah delivering her talk.